SPRING VALLEY – The Steele Canyon Cougars may be in the let-down spot of all let-down spots in East County high school football, but with the El Camino Wildcats first up for the champs in the San Diego CIF Division I playoffs, all the warning signs are clearly visible on the road to another title. The returning champions of both Division I and II will square off at Steele Canyon’s field on Friday night. For the Wildcats, the Division I title is theirs to defend. And certainly, the Cougar players have been informed of the challenge presented by the Avocado leaguers. Yes, El Camino lost eight consecutive games after a one-point season-opening victory over Point Loma, but the end result was the county’s most difficult strength of schedule. And Steele Canyon head coach SCOTT LONGERBONE need only to remind his staff and tell these current players that the only other meetings between the two schools resulted in playoff exits for the Cougars in 2014 (quarterfinal) and ’15 (semifinal) to get their mind back in focus after last Friday night’s whirlwind victory over the Helix Highlanders. (12) EL CAMINO at (5) STEELE CANYON (8-2) – The Cougars are currently a league champion, a section champion and a state champion. A football program can’t do any better than that. That last meeting was won by El Camino, 28-18, in the Division I semifinals in 2015. The Wildcats also won the 2014 Division I quarterfinal game, 33-31. The eighth-ranked Cougars stunned Helix in the fourth quarter last Friday, as sophomore running back WESLEY NEELY III scored two touchdowns in the second half and senior quarterback NATHAN BARNETT had an 89-yard touchdown run when he kept the play alive by putting his hand on the ground while still in the backfield and then out-ran Helix’s great junior ELEYON NOA to down the sideline. CHANCE JOHNSON, on a sore knee, returned a punt 28 yards to the Helix 24-yard line with 2 1/2 minutes left to play, setting up the winning five-play drive. The defense got great plays by CAMERON EWERT, COWBOY LIPSCOMB, ANTOINE WALKER, and WILLIE PAGE, who had a game-sealing interception. The CIF seeding committee switched Grossmont to the 11-seed and dropped the Wildcats to the 12-seed in Division I to avoid a Foothiller rematch with Steele Canyon in the first round. El Camino has weapons and shouldn’t be overlooked. Quarterback BROCK MAMBER looks for JORDAN WILKINS, while ZION JACKSON and NOAH SEGA carry the ball out of the backfield. 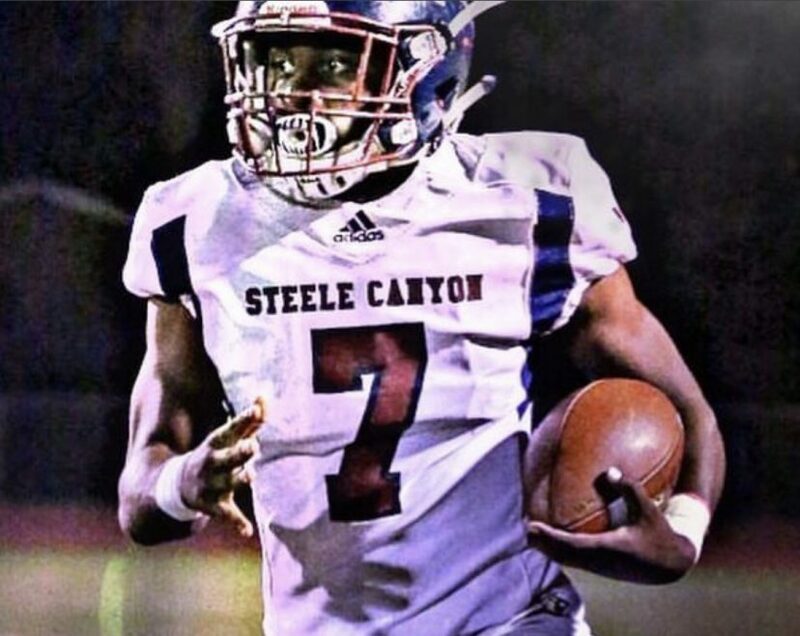 This isn’t the El Camino of old… STEELE CANYON, 41-24. (11) GROSSMONT (3-7) at (6) MADISON (6-4) – Grossmont and Madison have similar enrollments, have been around forever, and are located just 15 miles apart, yet, somehow, this will be the first-ever meeting on the football field between the historic schools. The Foothillers put together their most complete performance of the season last Friday on Senior Night last Friday, and appropriately, the seniors were on their game, as the Foothillers finished 2-2 in the Hills League. Seniors DESMOND CARTER, DAMARI CRAWFORD, ZAK FARRIS and THOMAS MANGUM caught touchdown passes from junior JAIME ODOM. Senior linebacker ALEX GOLLEYOU had strip sack and returned the ball the other way 54 yards for a touchdown and senior CONNOR SANCHEZ had an interception. Grossmont also got a touchdown from senior JARROD LACY. The seniors on the offensive line – SEAN RUDE and NATHAN KITCHEN – closed out there home careers in near-perfect fashion. Madison, which comes in ranked 13th in the county, was shut out in the second half and was upset by 17th-ranked Lincoln last Friday, 24-14, and the Warhawks also lost to Mira Mesa two weeks ago. Madison star back Kenan Christon has nearly 1,000 yards rushing this season, while senior DANIEL STOKES can run, throw and catch, and K’EONTAE SPRINGS is another downfield threat. Madison has been in the top ten pretty much all season, but the Warhawks’ last two results can give the Hillers hope… MADISON, 35-21. (9) EL CAPITAN (3-7) at (8) UNIVERSITY CITY (4-6) – In Division III, otherwise known as the East County Invitational, the El Capitan Vaqueros get a downright reasonable chance in their evenly-matched contest at University City. Last Friday night against the Foothillers, El Capitan senior AUSTIN BARKER had not one, but two kickoff returns for touchdowns, one in each half. Expect a lot of points to be scored in this one with quarterbacks WICK HAUSER, of the Vaqueros and UC’s Gunnar Gray. El Capitan senior star YAPHET YOKLEY missed last week’s contest, but Hauser can also look for reliable seniors ETHAN BURLESON and NATHAN SCHUNK. The Centurions, of course, feature one of the county’s top receivers in Casey Granfors, however, they have lost five straight games. El Capitan swept a home-and-home series in 2007 (EC 49, at UC 0) and ’08 (at EC 57, UC 30) in the only other meetings between the schools. The defenses could be scrambling in this one… UNIVERSITY CITY, 38-35. (10) WEST HILLS (8-2) at (7) IMPERIAL (6-4) – The only other meeting between these two clubs just happened to come in the 2014 CIF playoffs, a game won by the Wolf Pack, 41-27, but that one was held in Santee and this one is in the Imperial Valley at Shimamoto-Simpson Stadium. After winning that game in 2014, WHHS lost at Brawley, 29-13. The Pack is 2-3 when playing in the I.V. The Pack ended up the 10-seed in Division III following the 35-0 loss in the big Grossmont Valley League championship game against the Monte Vista Monarchs last Friday night in Spring Valley. West Hills certainly has a more than just a chance for victory here against Imperial, though the logistics could put them at a disadvantage. The one is a matchup of good dual-threat quarterbacks. JORDIN YOUNG, of the Wolf Pack, has over 1,700 yards of total offense and has accounted for 22 touchdowns. Santiago De La Torre, of the Tigers, has over 2,000 yards of total offense. Also, watch out of Tiger junior slotback Joey Ramos, who has 14 touchdowns this season. Nathan Hart is a third serious threat on offense. Imperial won 61-0 over Palo Verde Valley last Friday, but West Hills’ defense has produced 26 sacks this season. Seniors SAUL SANCHEZ and HUNTER GAUTHIER, along with junior JAKE MAHEU, have registered four sacks apiece. The Wolf Pack defense has allowed less than 14 points per game… WEST HILLS, 24-23. (12) LA JOLLA COUNTRY DAY (2-7) at (5) SANTANA (5-5) – It was only two years ago that LJCD defeated the Sultans in the SDS-CIF D4 championship game at Southwestern College’s Devore Stadium, 38-24. Santana was an underdog on that afternoon and played well, but now the Sultans are the favorites against the Torreys after earning a home game in the San Diego CIF Division IV playoffs at Santee Community Stadium. Junior NATHAN TEMPLE returned from a shoulder injury last Friday to pass for two scores and rush for another in a win at El Cajon Valley. His return puts happy senior SEAN IVERSON back out at receiver which makes sophomore JARED FORSTER even more valuable. Also, senior IAN LITTEN, who has missed much of the bulk of the season, had one of the Sultans’ seven sacks last week. La Jolla Country Day is coming off a loss to Classical Academy, 34-27, as Torrey quarterback Philip Gooding completed 20-of-40 passes for 280 yards and two touchdowns. Sophomore receiver Daniel Rosenberg had six catches for over 100 yards and a score. The passing Torreys average just 2 yards per rush. The schools did meet on the football field 51 years ago but it was the Torreys against the Sultans’ junior varsity on that day. Santana will need the varsity this time… SANTANA, 34-31. (12) ARMY-NAVY ACADEMY (3-7) at (5) MOUNTAIN EMPIRE (7-3) – Two of the oldest schools in San Diego County but the football teams didn’t meet until 1947 in what was at the time the longest road trip in then-Redskin history. The schools have met a few times since then. Try 50 times. Army-Navy leads this traditional series, 29-20-1. But consider, the Warriors won the first six and 8-of-the-first-9. Only once, however, has the game meant something in the postseason. The squads met at Mount Miguel High in 1979 with ANA winning, 16-7. The Manzanita League-champion Mountain Empire RedHawks will open the Division V playoffs at home against Army-Navy, from the Pacific League. Last Friday night, senior DALLAS PRINCE had three interceptions, including a 50-yard return for a score, and a 75-yard touchdown reception, as Mountain Empire won the Manzanita banner with a 45-16 drubbing of the Vincent Memorial Scots. RedHawk senior GABRIEL HYDORN passed for four touchdowns in the win. Mountain Empire had six interceptions, overall. NICK ROSE, CAMERON WILL, and MARCUS SMITH had picks in the fourth. Holtville, which lost to the RedHawks, earned the No. 4 seed. MEHS still finished behind the Scots in the rankings, as well, but were moved up one spot likely based on Friday night’s win. The RedHawks are on a four-game winning streak and are a big favorite to advance to the next round… MOUNTAIN EMPIRE, 31-0. (4) BORREGO SPRINGS (9-1) at (1) FOOTHILLS CHRISTIAN (7-2) – The Ocean League-champion Knights take on the Citrus League-champion Rams in the San Diego Section 8-man semifinals at Parkway Middle School’s Seau Field. Both teams went undefeated in league play. Only four teams qualified for the postseason in the division. These clubs have met eight times, with Foothills up 7-1 in both 8- and 11-man football. The Rams’ victory was a 41-0 decision in 2013, The teams also were in the same league in 2007-11 and 2013. Last season, Foothills won a 54-0 decision over the Rams. Borrego owns just two all-time playoff wins (2004-05), both against neighbor Warner. Otherwise, they are 0-6, including a 2016 loss to Calvin Christian, 51-0. Still, this version of the Rams has been impressive offensively this season, averaging over 48 points per game, and have scored 44 rushing touchdowns. But the Knights play defense like few others in the 8-man game, allowing just 18 points per outing. The Knights knocked down host Julian, 28-6, last Friday after the game was tied a 6-all at halftime. Junior quarterback KEVIN MROZ has passed for 16 touchdowns and rushed for nine more this season for the Knights. Junior KEVIN HELFERS and senior P.J. ZASTOUPIL have both rushed for four touchdowns for FCHS. Sophomore BLAKE MCINTYRE leads the Knights with six touchdowns receptions this season. Junior HUNTER NICKELL, who had an interception last week, has 10 1/2 sacks on the season. Since returning to 8-man football in 2015, the Knights have posted a composite 29-10 overall record, including a 7-2 mark this season. A triumph over a surging Borrego Springs program will give the FCHS its third-most victories since it started playing football in 2005… FOOTHILLS CHRISTIAN, 35-21.